This page contains weather records for the Crestone area. Crestone's official weather records first started to be recorded on March 15, 1982. This page was last updated on April 25, 2019. All data and record events shown below from March 1982 till January 1, 2003, were complied by Crestone's official weather observer, the late Hal Reinhart, at his station, located 1 mile northeast of the present station. All data and record events shown below after January 1, 2003, comes from this online station (unless other wise noted), which became Crestone's official station on September 25, 2006 . Special thanks to Hal's daughter Julie Sutherland for helping me collect her father's records, and also to Randy Gray at the Pueblo Weather Office, for filling in the missing pieces from Hal's earliest records. Precip is recorded in inches. Extremes for each month are in bold. Totals in parenthesis indicate incomplete readings, either for the month or the current year, such totals are not included in the monthly/yearly averages that are listed. M equals missing info. (Note: Snowfall data is missing for several dates before the 2002-03 snow season, with the month of September missing all snowfall data before 1999). Snow seasons 1982-83 till 2017-18, recorded in inches. Snow seasons runs from July 1 to June 30. Amounts are recorded in inches. T equals a trace. Most snow for each month in bold. Totals in parenthesis and smaller text indicate incomplete readings either for the month or entire year - such totals are not included in the monthly/yearly averages that are listed. However, snowfall data is missing for several dates before the 2002-03 snow season, with the month of September missing all snowfall data before 1999, other than for some trace reports, yet these missing dates are still official in the records, therefore no parenthesis are used for those totals. The date noted in the records for the latest measurable snow is June 13, 1983. The date for the earliest snow is unofficially September 3, 1961, when an estimated 4" fell. The entire state received snow on that day with 2 to 8" being recorded in and around the valley at official weather stations, however, Crestone did not have an official station back then. Since snowfall records made before September 2002 are incomplete, this list will start out from when I first moved to Crestone/Baca and started keeping weather records. I understand that many locals who were living here in 1997, claimed that the largest 24 hour snowfall ever to hit this area happened on the day after Thanksgiving, November 24,1997, when 30.5 inches was officially recorded at the old station. But several others who lived nearby that station, all claimed to have measured much more than that amount, anywhere from at least 35 inches, to just over 40 inches of snow. So we will never know for sure just how much fell on that day, but amounts can and do vary for areas as close as just a quarter mile away in some storms, and I'm sure where the 40 inches was recorded, was an accurate reading, since the person who recorded it is still one of our reliable spotters today (as of the 2017-18 season). Anyway, I do know that the below list is 100% accurate, no question about it! This list covers snowfalls of 10 or more inches. Note: Another 3 different snowstorms since 2002 had exactly 9.9 inches of snowfall fall in each of them. *Note: All time high temp reading noted below, 98°, was taken at Hal's old station in 2005, before this station was Crestone's official station. Reading was 97° at this station on that day. Average last freeze is around June 1, and average first freeze is around September 15. See first and last freeze date page for more info. *All high and low temperature records up until Sept 2006, were recorded at Hal's old Crestone weather station, located 1 mile northeast of present station, all records afterwards come from this station. **On August 9, 2009, freezing temps and frost was reported nearby in the Grants and in most of the valley. 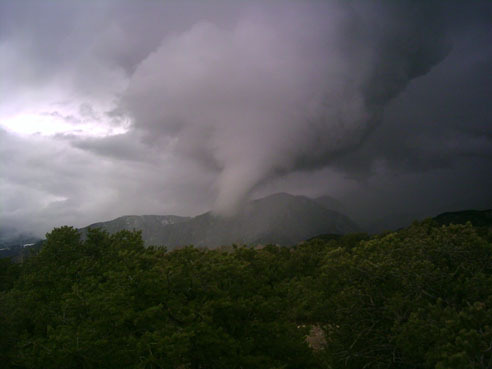 The only tornado ever to hit Crestone occurred on April 24, 2005 (see photo of its funnel about to hit the ground). Here are some all time cold temperatures (in degrees Fahrenheit) for selected Colorado towns. Note: For world records, go here. Here are some all time warm temperatures (in degrees Fahrenheit) for selected Colorado towns. Copyright © 2004 - 2019 by Keno Internet Services,except where otherwise noted. All rights reserved.